Smart Women Got it Done: Code Girls was the catchy title given to the session partially sponsored by Women United in Philanthropy at the 2018 Virginia Festival of the Book. 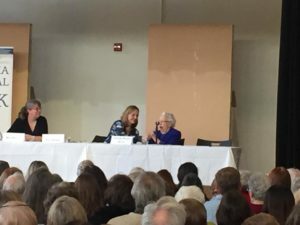 The session, held at the Jefferson School African American Heritage Center on Thursday, March 22nd, featured author Liz Mundy and WWII cryptographer Dorothy Braden Bruce. The book, Code Girls, The Untold Story of the American Women Code Breakers of WWII, reveals the story of thousands of American women recruited by the Army and Navy to serve as code breakers. The women faced sexism and misogyny while keeping their service secret.